I had tried this several years ago and decided to give it another shot. Setup says to remove quicklaunch toolbar, THAT took me a while to get it back the way I wanted it once I decided that this TLB was crap. If you want a truly portable, FREE, and very customizable personal start menu, try SYMENU. You don't have to install any or all of the Freeware apps from Nirsoft or System internals unless you want to. I chose not to, because I already have them elsewhere and use it strictly as a Start Menu that resides in the System Tray. WAY better than TLB in my opinion anyway. To each his own and I'm sure some are really attached to TLB, but the best I can give it is a TWO. Great launcher, used to pirate it when I was a kid and now I bought it. 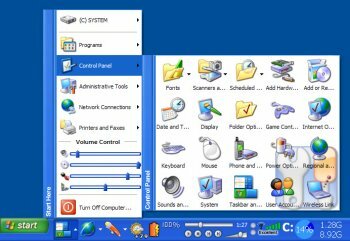 I use it to have multiple quicklaunch-like toolbars, which are synced across multiple computers, by the use of megasync (used to do dropbox in the past). All my shortcuts are 1 click away, or 2 clicks away within a menu folder. No need to search through the start button and no cluttered quicklaunch. This much more than just a launcher. I can see CPU usage, network usage, drive activity, etc. at all times. Unlike gadgets that get hidden when running apps, this info can be displayed at all times on the bottom bar. On my laptop, I also find it useful to have a volume control slider handy. Show battery status, key state or many other options. The launcher is merely just one of many functions this is capable of performing. If you are so desperate to have a launcher then you could at least use Rocketdock. 12MB for a quicklaunch bar??? Guys, even MicroSoft makes more optimised programs... Besides, I can't understand useless programs that try to invent hot water. People, you have QuickLaunch that can hold 10-20 programs to look reasonable, you have the whole desktop for shortcuts, you can organise by hand your Start menu... what use is yet another place to start your programs with that consumes so much memory and CPU in the background. Mayb e I could understand if it was freeware, but it's not. Too many people got their hands on tools like Visual Basic and .NET and writing just about any program with these tools takes megabytes instead of kilobytes. What a shame. No stars. Ok, I'll give you one if I must. Cons: As CyberDoc999 mentioned, WAY too busy. Confusing setup. Nagging Demo button if you are just wanting to try it out. Bottom Line: I had tried this several years ago and decided to give it another shot. Setup says to remove quicklaunch toolbar, THAT took me a while to get it back the way I wanted it once I decided that this TLB was crap. Between True Launch Bar and Find and Run Robot I have no need for the Start menu. On the face of it, it may look as though TLB just puts shortcuts in the Quick Launch area (which you can do manually indeed), but that's barely scratching the surface. TLB is infinitely configurable, allowing you to make it look and behave exactly as is convenient to you. Best of all, it comes with a fantastic support for both keyboard and mouse. I have nine TLB "folders", each with its own icon, and a Win+digit hotkey assigned to each. Win+1 opens the folder I use the most, with office apps, browser, email etc., Win+3 opens my folder with media players, and so on. So most of the time I don't need the mouse to start the app I want. But if you're already mousing around, TLB can open up the folders by just hovering the mouse pointer over them - much easier and faster this way. TLB is a very carefully thought-out and well-designed application, with just the right set of features. Design-wise, it's way up there with the best like Total Commander and Beyond Compare. It's one of the rare apps that feel just right, and when you think you need a feature, most of the time you find out it's already there for you. True Launch Bar is far more -and far more convenient- than merely making taskbar icons shortcut to folders. Functionality goes way beyond such a crude expedient ! When using the default Win7 start menu, you are very limited when trying to make cascading menus for your own shortcuts (unless you go with the old crusty classic start menu). This is a great solution with a ton of extra functionality. Good stuff. ie: "My Documents"\Shortcuts, or even your "Desktop". etc. All Your shortcuts are organized in a folder. You can also do something like this with AutoHotKey, or a plethora of "Menu Tools" like digitalis' ShortPopUp, CLCL (Clipboard utility, that allows for Hotkeys and MenuPop ups) among many others. I'd have to agree with the value proposition: $20 is highly overpriced. Even my FileManager and Text Editors that are used constantly were only $30-$40 -- and lifetime licenses. For those of us who are heavy Quick Launch users, it's worth ~every~ penny !